He’s pegged on 66th position coming a spot ahead of Vice President of the United States of America, Mike Pence who’s pegged on number 67 on the list. 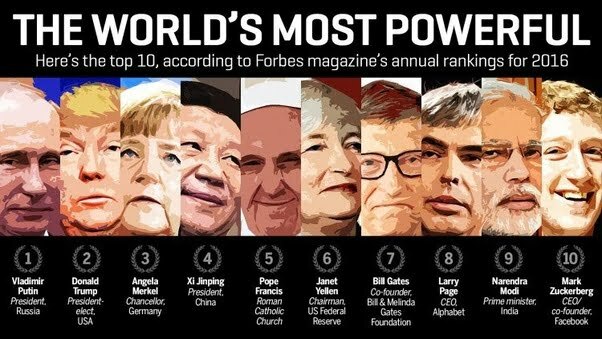 Four factors were taken into account to select each of the World’s Most Powerful People: how many people over whom they have power; the financial resources they control; if they have influence in more than one sphere; and how actively they wield their power to change the world. China’s president, Xi Jinping for what he was able to pull off this year, is one the number 1 spot. In March, 2018, China’s congress amended its constitution in March, eliminating term limits and broadening Xi’s influence. Russian President Vladimir Putin (No. 2) has been knocked out of the top spot, a title that he held for four consecutive years. President Donald Trump, a little over one year into his term, falls to the No. 3 spot.